The nation’s science and engineering (S&E) workforce and public and private sector investments in research and development (R&D) are essential to continued economic growth, improvements in the standard of living, and progress on many important aspects of well-being, including safety and health. CNSTAT has conducted in-depth reviews of the portfolio of data collection programs of the National Science Foundation on S&E education and employment and R&D by the federal government, industry, and academia, seeking to make each survey more relevant, timely, and cost-effective. A recently completed study identified various indicators of science, technology, and innovation (STI) for the National Center for Science and Engineering Statistics (NCSES) to prioritize and develop, modify, and highlight in the future. STI indicators are vital to give policy makers a sense of how the United States compares with other countries and to help answer questions about the best use of government resources for bolstering the S&E enterprise. New CNSTAT studies are underway of R&D by the growing nonprofit sector and alternatives for redesigning the suite of S&E personnel surveys to adopt state-of-the-art data collection methods and make the best use of other data sources, including the American Community Survey. "NCSES/CNSTAT Workshop on Advancing Concepts and Models of Innovative Activity and STI Indicator Systems"
Read more and download the presentations. 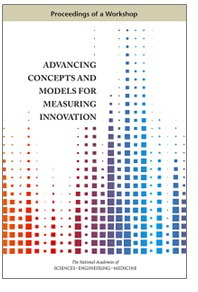 These proceedings from the Committee on National Statistics summarize a workshop held in May 2016 that brought together academic researchers, private and public sector experts, and representatives from public policy agencies to develop strategies for broadening and modernizing innovation information systems. The workshop was organized to assist the National Science Foundation in refining and prioritizing its work on innovation metrics to maximize the relevance and utility of its data collection programs and statistical products to users. The workshop served as a continuation of discussions on conceptualizing and measuring innovation—its inputs, dynamics, outputs, and consequences—in a way that reveals elements that are measured well and those that are measured inaccurately or not at all. Presenters and discussants were asked to take into account the role of innovation not just as it affects economic growth and productivity, but also as a mechanism for creating greater public good and meeting social challenges that are often nonmarket in nature. Workshop participants were also asked to consider how new kinds of data can be used to complement more traditional survey and administrative sources in the construction of innovation metrics. Throughout the discussions, one objective was to identify questions that cannot be answered well now but potentially could be with additional data that have a reasonable chance of being collected. An ad hoc panel, convened under the Committee on National Statistics (CNSTAT), in collaboration with the Board on Science, Technology, and Economic Policy (STEP), conducted a study of the status of the science, technology, and innovation (STI) indicators that are currently developed and published by the National Science Foundation's (NSF) National Center for Science and Engineering Statistics (NCSES). After the study was completed in 2014, the panel released their final report, which included conclusions and recommendations on the topic. The major focus of the panel was to assess and provide recommendations regarding the need for revised, refocused, and newly developed indicators designed to better reflect fundamental and rapid changes that are reshaping global science, technology and innovation (STI) systems. The study addressed indicators development by NCSES in its role as a U.S. federal statistical agency charged with providing balanced, policy relevant but policy-neutral information to the President, federal executive agencies, the National Science Board, the Congress, and the public. The study involved assessing the utility of STI indicators currently used or under development in the United States and by other governments and international organizations. Based on these activities, the study panel developed a priority ordering for refining, making more internationally comparable, or developing a set of new STI indicators on which NCSES should focus on, along with a discussion of the rationale for the assigned priorities. NCSES is particularly interested in the international scope of STI indicators and the need for developing new indicators that measure developments in innovative activities in the U.S. and abroad. The forward-looking aspect of this study is paramount; NCSES requested that the panel’s foresight included the types of data, metrics and indicators that will be particularly influential in evidentiary policy decision-making for years to come. The panel produced an interim report at the end of the first year of the study indicating its approach to reviewing the needs and priorities for STI indicators. On February 3, 2012, the Panel on Developing Science, Technology, and Innovation Indicators for the Future, co-chaired by Robert E. Litan and Andrew W. Wyckoff, released “Improving Measures of Science, Technology, and Innovation: Interim Report," which examines the status of the NCSES's science, technology, and innovation (STI) indicators. 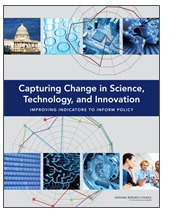 The report assesses and provides recommendations regarding the need for revised, refocused, and newly developed indicators designed to better reflect fundamental and rapid changes that are reshaping global science, technology, and innovation systems. It also outlines the international scope of STI indicators and the need for developing new indicators that measure developments in innovative activities in the United States and abroad. The report offers foresight on the types of data, metrics, and indicators that will be particularly influential in evidentiary policy decision-making for years to come.